This summer was kinda a dud. We didn't take a proper vacation (we're going to in October, tho'! ), and the summer just seemed too short. It got very warm for a handful of days, but it also rained and there were quite a few overcast days. So when just about every food blog I read says fall’s here, I’m thinking it’s been here since July. There are so many grilling recipes I haven’t been able to try and now those will have to wait until next year (because I don't have a gas grill). Instead, over the next couple of weeks I will be storing away garden furniture and preparing my gardens for the coming winter. There's just too much to do and I'm not at all in the mood to do it. BUT, I'm in the mood to cook fall food. I have a ton of soups, stews and casseroles I want to make. What better way to start off than with a hearty black bean and chorizo soup? This recipe was adapted from Molly Katzen’s Brazilian Black Bean Soup found in the Moosewood Cookbook. The most important change I made was the addition of the chorizo, but the basic recipe is there (as far as I'm concerned anything that has chorizo is going to be awesome). You may feel a little dubious about the orange juice, but I promise, it makes the soup, so don't leave it out. In a large stockpot over medium heat, cook the beans in enough water to cover them by 1 inch. They may take 1 1/2 to 2 hours to become tender. Add more water to keep the level above the beans, if necessary. In the meantime, brown the sausage in a Dutch oven or heavy bottom large pot. When nice and browned, remove and aside. To the same pot, add the onion, celery and carrot. Saute until soft, then add the garlic and cumin. Return the sausage to the pot and stir well. Add the chicken stock and orange juice (add 1 cup first, then more if you like). Bring to a boil then reduce the heat and simmer covered. When the beans are done, drain them and add them to the soup. Season the soup well with salt and pepper. I like to serve this soup warm (not piping hot!) 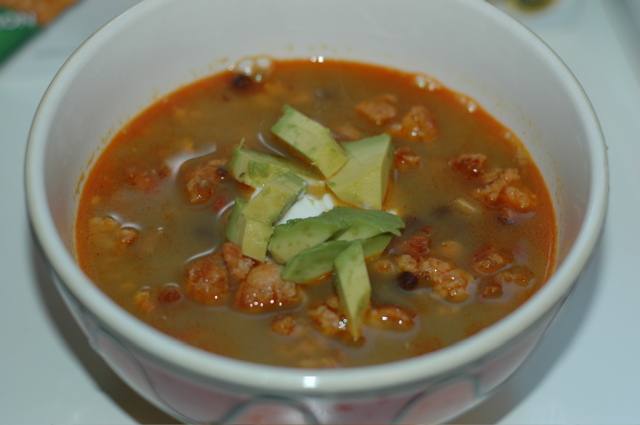 with a dollop of sour cream, chopped jarred jalapenos, chopped cilantro, chopped avocado and/or chopped tomatoes. Mix all the ingredients together, preferably 3 or 4 hours before use, and keep in the fridge until needed.